Panasonic Enterprise Solutions Company enlisted the help of Astucemedia—a Montreal-based provider of live broadcast graphics services with an office in Dubai, UAE—to provide graphics design with real-time data integration services to Big Hoss TV. Recognized by Guinness World Records as the world’s largest high-definition LED video board, Big Hoss TV enhances the fan experience for those attending NASCAR and other motor sports events at the Texas Motor Speedway in Dallas. The screen—which measures 218 feet wide by 94.5 feet high—delivers coverage of racing events as they take place, including field interviews with drivers and their pit crews, 1080p HD camera footage, instant replays of high-speed race action and interactive features and games for the fans at Texas Motor Speedway. The big board also displays live tweets and real-time graphics depicting the drivers’ MPH, RPMs, speed, leaderboards and other vital racing stats. Big Hoss TV also renders uncompressed 4K-resolution video directly out of a Viz Engine—Vizrt’s 3D live graphics/video compositing rendering engine—to the HD LED display. The HD LED drivers extract a 3K center-cut from the 4K Vizrt video output. This installation also utilized another Vizrt live graphics system—the Viz Trio CG—that complements the Viz Engine for rendering. The solution is controlled by Panasonic’s exclusive new stadium controller designed for complete Vizrt Integration. 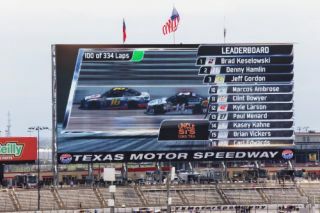 Texas Motor Speedway commissioned Panasonic Enterprise Solutions Company—a division of Panasonic Corporation of North America—to build the Big Hoss TV display. Panasonic also provided systems integration services for an in-stadium production control room used to produce Big Hoss TV shows. When Panasonic asked Astucemedia to contribute its broadcast graphics expertise to the project, Astucemedia delivered a custom, turnkey solution spanning graphics design and creation to real-time data integration. Astucemedia also provided on-site services at Texas Motor Speedway when Big Hoss TV was unveiled in early April 2014 during a double-header of two high-profile NASCAR races: the Nationwide Series O’Reilly Auto Parts 300 and the Sprint Cup Series Duck Commander 500, and in June for another high-profile double-header: NASCAR Camping World Truck Series WinStar World Casino & Resort 400 and the Verizon IndyCar Series Firestone 600. For the Big Hoss TV graphics workflow, Astucemedia provided a solution that leveraged elements of its Data Platform. Four (4) high-frequency live data feeds from NASCAR Scoring & Timing, Sportvision, IndyCar and SMT (Cosworth Live-To-Air) were captured to create a real-time “blended feed” REST API. The real-time data, including race statistics and car telemetry such as MPH, RPM, GPS and track temperatures, was easily embedded into the graphics scenes using Astucemedia’s Vizrt plug-ins. Viz Trio operation was performed via a custom GUI template that uses a push-button interface as well as a responsive HTML5 app that was used to monitor data, trigger graphics and switch between feed providers.